In a move that is not surprising is the fact that while the Democrats have lost their power, we see them now resorting to new levels of hatred in their attacks of Trump, no longer are they willing to just oppose him, they want to say he is now comparable to Hitler. I must say, I know Hitler, being Jewish thought it was a good idea to know how he rose to power, how he stole the hearts of the Germans, his ideology, and the evil doings of the Fascist regime. I can promise you, neither he nor the GOP are like the fascist, the claim is nothing but blowing hot air. Congressman Hank Johnson, who is seen in the video above, does nothing but spew unsubstantiated claims, but seems having proof is not on this racist’s mind. He claims Trump supporters are living shorter lives, are alcoholics, drug addicts, but I must ask, could you Congressman show me the evidence of this? We both know he can’t. What is more, this is being said in the NAACP, an organization that was set up to support civil rights, but these members are going along with this speech, turns out the organization set up to fight hate speech are becoming the worst enablers of it. The NAACP claims to represent minorities, to protect them from racial injustice, but they do nothing for Asians or Hispanics, Arabs as well, all they seem to care about is one race, the rest they could care less about. Their goal is to race bait, then take people to court to enrich a few. One has to wonder, why is such a hateful man allowed to speak and get by with it, where is the outrage? We know if a GOP member had stood up and compared Obama to Hitler, and the similarities are far more significant with Obama then they are with Trump, the outrage would have reached the heavens. So let’s do what many will not; let’s look at Hitler, then look at both the DNC and the GOP today. Hitler rode to power in a nation that was set up by a nation that had lost its identity, was suffering from suffocating reparations placed on it a few years prior by the victors in WW1. There were multiple parties vying for control, royalist wanted the Kaiser back, communist want to bring socialism back to Germany, you had a democracy that was trying to get a foothold in this nation, and for a time it looked like it would succeed. Hitler was the leader for the National German Socialist Workers’ Party, it was commonly referred to as the Fascist party later, due to it practiced the ideology of fascism. 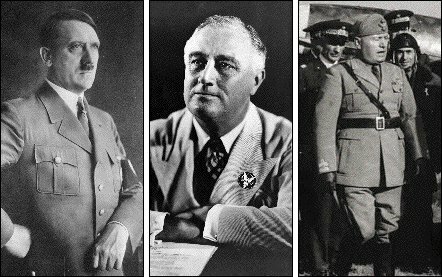 The claim that the party practiced far-right ideology is a lie, I get into this with How the Left Rewrote The History Of Fascism, turns out Roosevelt and the left were huge fans of Fascism when it first appeared on the scene, Roosevelt even sent over his own advisors to study the ideology, spoke glowingly of it. While there were some aspects of far-right ideology, the desire to control the press is right out of the socialist handbook, something the DNC does rather well today, except for FOX, a thorn in their side to this day. There is also the case of science that was deemed worthy of the state, to question that science would have gotten you either in legal trouble, or if you were in the teaching field would have cost you your job. Today you see the same type of calls from the left when someone dares to ask questions about Evolution, Global Warming or dares to question the claim that there is scientific evidence that sexuality is fluid. The left, like the Fascist of old, has turned some science into a dogma, dare to question it at your own peril. The Fascist of old hated the Jews, went out of their way to destroy them, today the modern Democratic party seems to come from the same vein, they hate the Jews as well. The Fascist hated the Gypsies, the Modern Day Fascist, oops mean the Democrats hate the whites, not sure if there is to much difference between the two, just listen to Senator Johnson, he tells it very well himself. But let’s dig further, what does the left say about the Whites? In November 2017, Campus Reform reported on an op-ed that was published in Texas State University’s student newspaper, which, among other things, called white people “an abomination.” In Fascist Germany this was said quite often against the undesirables, the Jews, Jehovia Witnesses, Gypsies, and Slavic people, was used as a reason to try to liquidate them. The Star’s Editor-in-Chief, Denise Cervantes, addressed that line of reasoning in an editor’s note published on the paper’s website Tuesday night, though as of press time there was still no digital version of the original op-ed. I love how they explain away this, but I must ask, if someone from the opposite view had written this about say, Blacks or Hispanics, do you think they would have published it? We all know the answer to it, racial attacks against whites is the “in thing” by the intolerant left today, how long until it becomes something worse? A little over a month ago Congress passed a resolution against “hate,” which is laughable. Never has Congress been filled with more hateful people. We have a government full of evil liberals and cowardly RINO Republicans who hate Christians, whites and men. Turns out they hate any speech they see as hateful unless it is directed at these two groups, then have at it. As a Jew I have learned if they don’t come for me first, they will after they come for the Whites and Christians, it is only a matter of time, that is why I stand up against this tyranny, call out people like Congressman Hank Johnson, and his hate-filled speech, the left who is making this routine, it is time we stand up to this, or what we saw in Germany could be merely a small step to what may come next. We need to stop this in our schools, or maybe look at stop funding of them. I am all for higher education, took part in it myself, but this is not what our youth are receiving today, they are getting a little knowledge with a whole lot of political programming, this needs to stop, we need to take back our schools from the hateful left. Our press is supposed to give us unbiased news; people are now turning to the internet because they are getting anything but impartial. If you are going to pretend to present the news, then at least show you are offering it as an opinion piece; otherwise you are doing your viewers a disservice. We need to start to attack the racism from the left, call it out and expose them. Too many times we see politicians shrinking away, afraid they may be called racist, I say who cares, all racism means today is you are not a liberal. It was abused so badly under the Obama administration to attack political foes that it has lost all meaning. I find when people say this to me, I look at them and laugh, hold up my hand to them and tell them I reject this, they go nuts, but it is rather fun to do this to them. Congressman Hank Johnson need to go. If they want boycotts, then bring it on, we can do so back, our numbers are much greater, so is our buying power, let companies know if you are going to follow along with this, it is going to hurt you in a bad way. It is time we start to fight fire with fire. Is Palestinian Aid Next On the Aid Chopping Block?